Thanks for writing! I’m really excited to hear that my artwork has inspired you to paint! I think that could be one of the best things someone could tell me. Many painters have a well thought out color palette that they use on a regular basis. By creating those parameters for themselves, they essentially create within a box. This gives their art continuity. They’re able to in their own way master certain aspects of those colors. I’ve always envied artists who can stick to their guns like that. I lack that sort of discipline. I don’t have a well thought out palette. When I visit the art store I say, “ooh, that’s a cool color!”, and usually buy accordingly. I do use certain colors more regularly than others, and I’d be happy to share those with you. My brand of choice is Gamblin oil paints. I think it’s a quality brand, better than most, but maybe not as good as some others. Some brands and pigments are too expensive for me as well. I use Winsor and Newton’s Liquin as my medium. Many people think I use paint pens, but I don’t. I use script, pinstripe, and numerous other brushes. I try to buy artist grade paint whenever possible. It has a higher pigment load. I find student grade frustrating on many levels. I sometimes use student grade to initially coat my wood surface. Since most of my artwork is labor intensive line work, the higher pigment load helps me not have to repeat my lines as much. The colors I use frequently are all of the Gamblin Radiant colors, Brown Pink, Ultramarine Blue, Olive Green, Cobalt Teal and Violet, Burnt Umber, Permanent Green Light, Quinacridone Magenta, and Cadmium Red and Yellow. 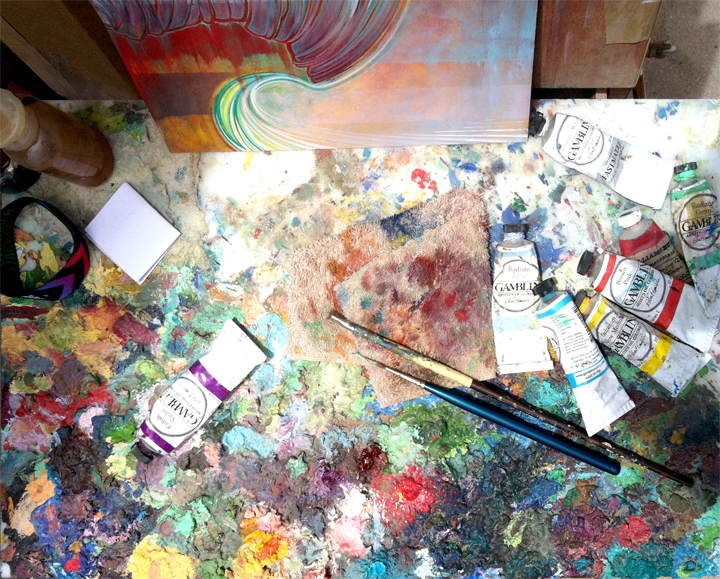 According to the label, the Cadmium colors give you cancer in California, so I wouldn’t use them there…just kidding. Color is very dynamic, and for me it’s probably the most interesting part of being an painter. I don’t claim to have any mastery of it, and I still learn a lot every time I experiment with it. This entry was posted on August 13, 2013 at 7:02 pm and is filed under Uncategorized. You can follow any responses to this entry through the RSS 2.0 feed. You can leave a response, or trackback from your own site.